Red Canyon served us well as a central location from which to explore much of the huge Dixie National Forest area, as well as farther south to Zion National Park and the North Rim of the Grand Canyon. When we first arrived at Red Canyon Village RV Park, located 17 miles west of the entrance to Bryce Canyon National Park on Scenic Byway 12, we thought we'd be there just a couple weeks and then find another one or more places to explore on our way south to our winter destination just north of Phoenix. We packed a lot of activity into that first week, thinking we might have just a short time there. Canyon on his first bike ride on this very cool trail. The white is not snow, but the color of the rocks. 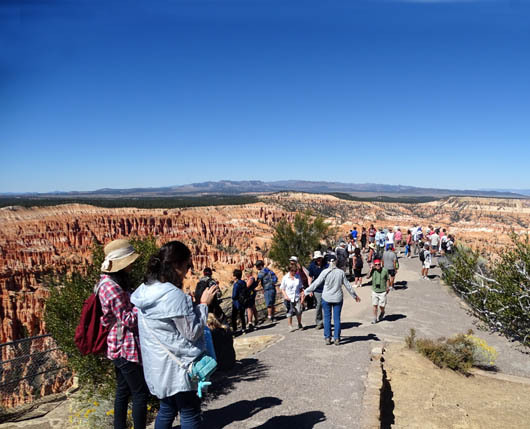 Since Red Canyon is so convenient to so many state and national parks, national monuments, and recreation areas we did several day trips to the west, south, and east early in our stay at Red Canyon. They were essentially scouting expeditions to see if we'd have enough trails, bike paths, and roads to hike and bike in each particular area, and to determine where we'd camp if we decided to go there. 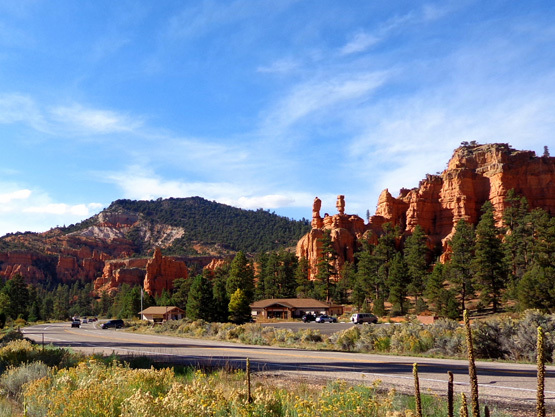 We soon realized we had so many great hiking and cycling opportunities close to home in Red Canyon and Bryce that we decided to stay put at Red Canyon Village RV Park for a month. One way our travel style has morphed in recent years -- as we've gotten older and have been RVing full time -- is to spend more time in areas we really like so we can do more in-depth exploration in a more relaxed manner. That has worked well for us here. Our pace became less frenetic after we made the decision to stay here for 31 days. We didn't waste time doing all the day trips. 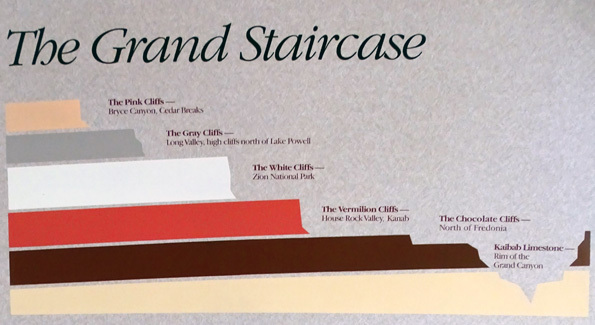 We saw some fantastic scenery and learned more about areas we've never visited before, like Grand Staircase-Escalante, or hadn't seen for decades, like Zion National Park and the North Rim of the Grand Canyon. And we have information we can use if we return to any of these other areas next year or later. on our day trip in October, we made advanced reservations there for early next spring instead of this fall. The purpose of this entry is to give an overview of the places we visited in southern Utah and northern Arizona from September 17 to October 18. 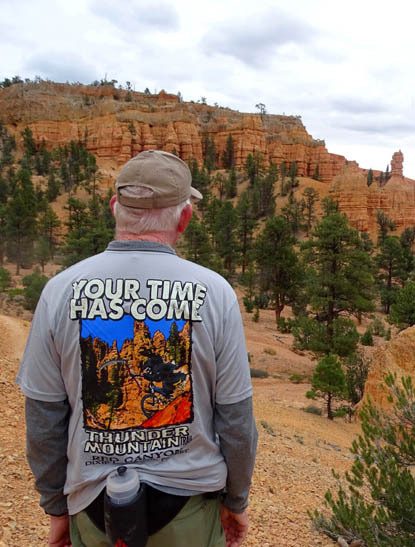 I'll have separate, more detailed entries about each location -- and multiple ones for the trails and awesome scenery in Red Canyon and Bryce Canyon. I marked Red Canyon with a red dot and the roads we traveled with yellow highlighting. There's a more detailed colored map of the parks and monuments in southern Utah and northern Arizona on this National Park Service web page but it's too big to show here. This is the very busy two-lane road that passes by our RV park. It starts two miles west of Red Canyon Village at US 89 and runs mostly east and north for 124 miles to Torrey, UT. It ends near the entrance to Capitol Reef National Park on UT 24. Along the way this uber-scenic roadway passes through some of the most unique landscapes in America. It runs through the middle of Red Canyon, the northern edge of Bryce Canyon NP, parts of Grand Staircase-Escalante National Monument, and Dixie National Forest. 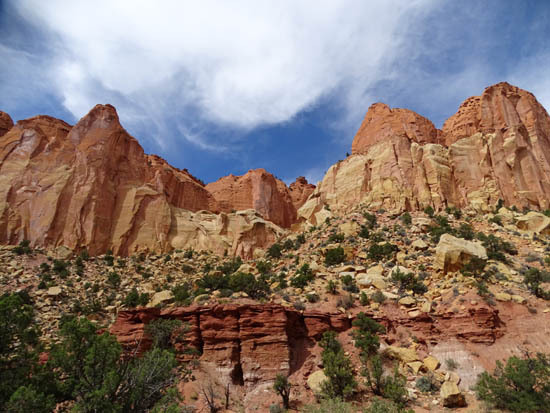 It accesses Kodachrome Basin State Park, Escalante Petrified Forest State Park, Anasazi State Park, and numerous 4WD roads, trails, canyons, lakes, reservoirs, and mountain summits. You could spend months, maybe even years, exploring this area by vehicle or on foot. 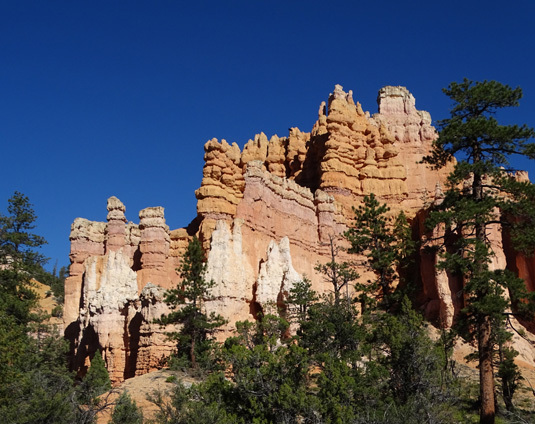 Except for Red Canyon and Bryce Canyon NP, we barely scratched the surface of this fascinating region on our day drive as far east as Boulder, UT and out another 19 miles on the scenic road called the Burr Trail. Although we didn't find a particular place we wanted to return this fall, we definitely want to explore more of this area in the future and visit Capitol Reef National Park and Glen Canyon National Recreation Area. Hwy. 12 is suitable for RVs as long as you aren't in a hurry. We've driven most of the route in our minivan. It is all paved, two lanes wide, and mostly smooth. It is very hilly, though, as it curves up and down from valleys and canyons to plateaus and mountain passes From what we've read and heard, the part of the scenic byway from Boulder to Torrey is as good as what we traveled. 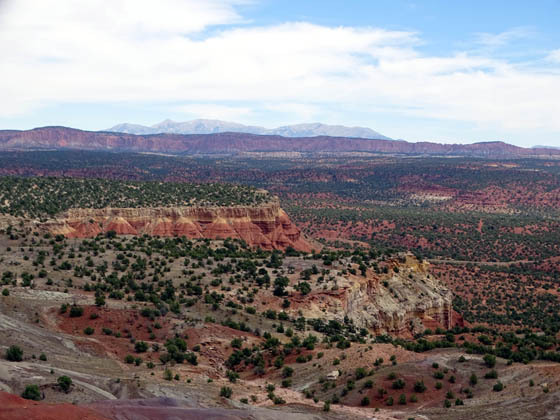 Red Canyon is where we focused much of our energy during this period of time. 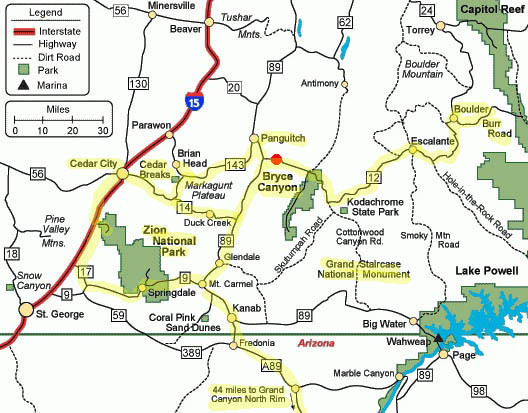 Scenic Byway 12 bisects the canyon for five miles east to west. More scenic canyons, cliffs, and hills stretch out for several miles on either side of the roadway in Dixie National Forest. There is a nice Forest Service campground in the canyon. 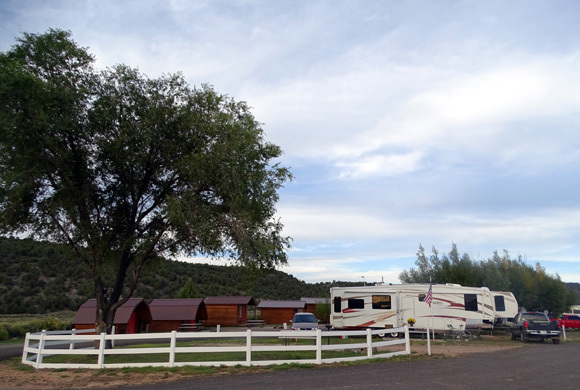 We weren't able to get a site there when we first arrived so we've been staying a couple miles down the road at Red Canyon Village RV Park. One of the things we did on Day One was to visit the Red Canyon Visitor Center, shown above, so we could see what there is to do in the area. The center has interesting exhibits and displays, tons of information, maps and guidebooks, an excellent trail map (I wore a few of those out), and various items for purchase. That's the Grim Reaper on a bike. If you saw some of the drop-offs from two of the super-narrow trail sections, you'd understand the humor. I also got myself a red rock-colored cotton t-shirt with a bright canyon design. The visitor center also offers trip planning advice, nature hikes, interpretive programs, photography classes, and solar/star programs. There are picnic areas and seasonal displays about the flora, fauna, geology, and history of the area. The link above has lots of other links you can click on for more information. The Arches Trail features a couple dozen rock arches or "windows." It's fun to find them! Several other trails allow bikes and horses, too. ATVs and other off-road vehicles mostly have their own separate trails, which is good for all concerned, although I've had more surprises with reckless cyclists than ATV drivers or dirt bikers. I'll have details about the trails in Red Canyon in subsequent entries. I've hiked almost all of them. It had been a while (20-30 years) since either of us had visited Bryce so the views from the overlooks and trails were almost like new to us. Since it was just 17 miles up through Red Canyon and along the Paunsaugunt Plateau to the park entrance, we drove there several times a week to hike and bike and sight-see. Jim also rode his bike back to the campground from the park several times, a distance of about 23 miles one way. I did that one time, too. 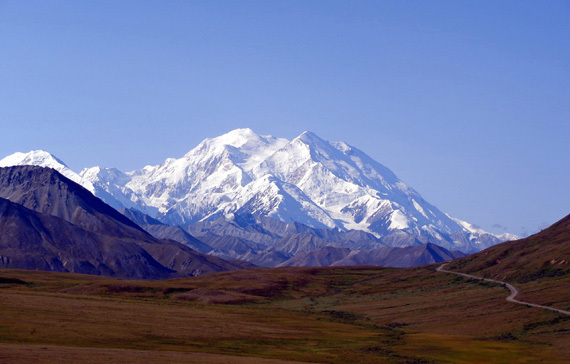 Visitation to this popular national park is high every season except winter (it's open then, too). We were surprised at the number of people there on rainy weekdays, but if you're on a tour bus or have only a short time frame to visit, you go to at least some of the overlooks even if it's raining. There were probably as many international visitors as U.S. citizens, if all the different languages I heard were any indication. I've had interesting conversations with people from all over the world. Many European and Asian visitors have a month of vacation, usually late summer or in the fall, and airfares are reportedly lower then. They love our national park system. hike down into the canyon on the majority of the trails because it's tough coming back up! We learned to get to the park very early in the morning if we wanted to park at any of the trailheads near the entrance. Some of them, like Fairyland and Bryce Point, have very few spots so they fill quickly. Larger parking areas like Sunrise and Sunset are so popular that you'll probably have to wait for an opening if you arrive after 9 AM. There is a free shuttle bus system that helps alleviate this problem. We never did ride a bus because we were usually schlepping backpacks or bicycles. I was OK with getting to trailheads early anyway because it was cooler to hike before noon -- the sun is hot in Utah at 8,000-9,000 feet elevations, even in the fall -- and because there were fewer people on the trails earlier in the day. Photographers love the "windows" or arches on the Peekaboo Trail. If you can't hike this trail you can ride a horse to this spot. We assume next year will be even more crowded because it's the National Park Service's 100th anniversary and they are advertising like crazy. We'd like to come back in the spring so we might have to contend with even more crowded conditions on the park roads and trails. Guess we're part of the problem, eh? There is no cost to enjoy the trails or drive through Red Canyon. And dogs are allowed on all of those trails. 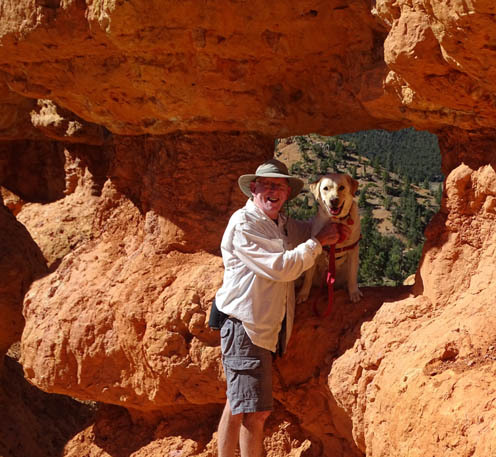 There IS an entry fee to Bryce Canyon if you don't have one of the NPS passes -- and no dogs are allowed on them unless they are service dogs. We both have senior passes so we got in free. Some activities, like camping, lodging, meals, and horseback rides, do cost $$ even for those of us with NPS passes but everything seems worth the cost to us. With a captive audience they could charge more than they do. Here's the link to the official park website. You'll need plenty of time if you want to thoroughly explore this huge wilderness area -- it encompasses almost two million acres of sandstone canyons, plateaus, cliffs, and unique rock formations! It's not easy to penetrate, either. No services are available and most of the access roads are dirt and either require 4WD or are impassable when wet. The weather can also be challenging. The rock colors are amazing, both from a distance and close-up. The monument is managed by the BM. 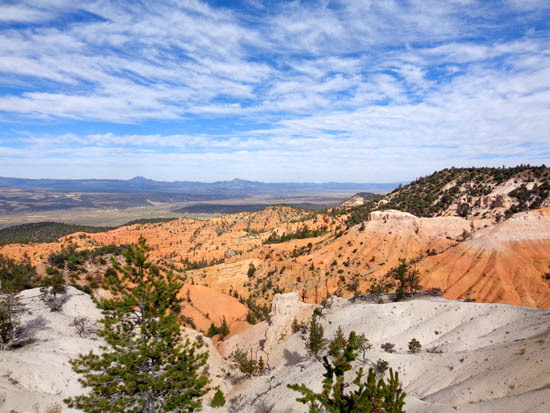 It is named for the Escalante River canyons and for the Grand Staircase, a series of colorful cliffs that gradually rise from the North Rim of the Grand Canyon to Bryce Canyon and Cedar Breaks. In one day trip out and back on Scenic Byway 12 to Boulder and 19 miles of the Burr Trail we saw an amazing variety of rocks from the roadways. It would be even more amazing up close on trails through the canyons or from cliff tops. (we learned some new terms at the USFS/BLM visitor center in the town of Escalante). Recreational activities include sight-seeing, photography, hiking, backpacking, road and trail cycling, camping, fishing, horseback riding, and ATVing, either on your own or on guided trips. There is no fee to drive through this monument or to participate in non-guided activities. I'll write more about the monument in a separate entry. I took almost 400 photos that day so there will be more than one page of pictures on the website when I sort through them. OK, let's go west from Red Canyon now. We drove up to Cedar Breaks twice, once in September when the aspens were quite colorful and again in early October after it snowed. Elevations at the visitor center, campground, and overlooks are above 10,000 feet, which is why I said we went "up." 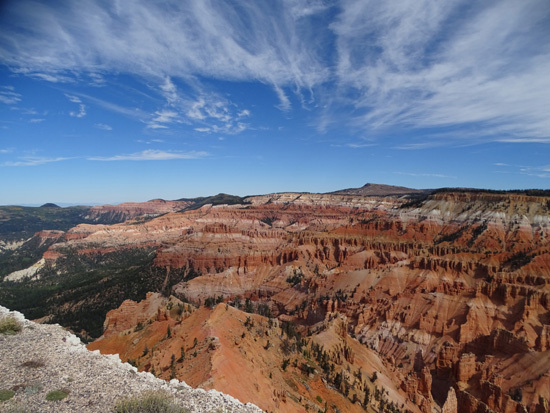 Two scenic byways intersect at Cedar Breaks, 143 and 148. Hwy. 148 runs off another scenic byway, Hwy. 14 that goes up and over the Markagunt Plateau to Cedar City. 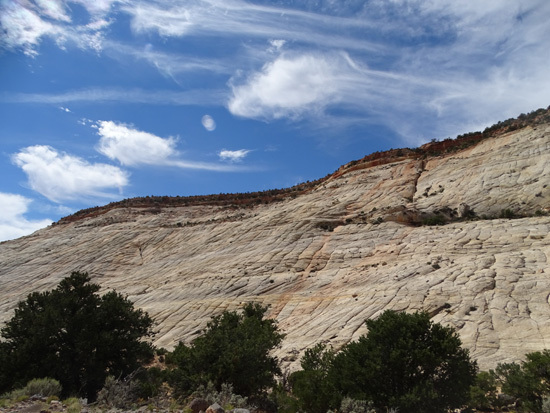 Scenic Byway 143 runs from Parowan to Brian Head and down to Panguitch. (Yes, these roads are all very scenic!) We've driven them and Jim rode his bike 23 miles from Cedar Breaks to Panguitch one day. 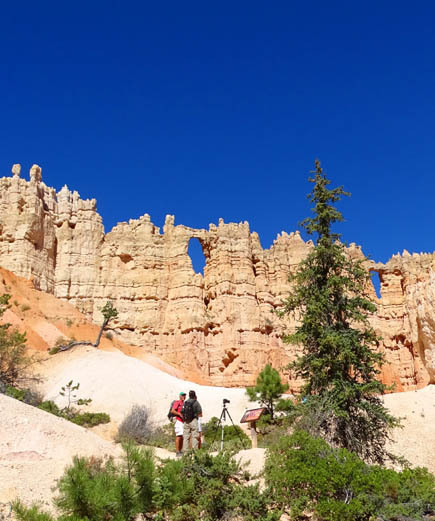 The main attraction at Cedar Breaks is a huge circle of "painted cliffs," colorful eroded rocks similar to those in Bryce Canyon but on a much smaller scale. 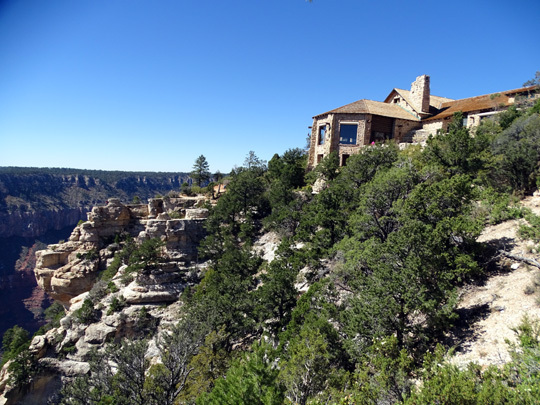 Several overlooks around the rim offer different perspectives into the canyon. The canyon is too large for one panoramic shot of all of it. 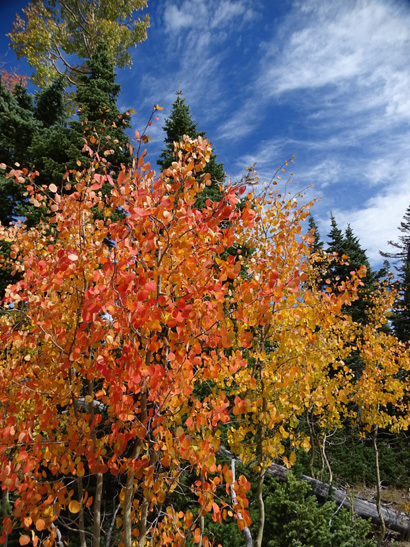 Popular activities include hiking, sightseeing, photography, camping, mountain biking, snowmobiling, cross-country skiing, and downhill skiing at Brian Head Ski Resort. Brian Head Peak tops out at 11,307 feet. Visitors are expected to stop at the visitor center on Hwy. 148 and either pay an entry fee or show their NPS pass for free entry. Ha -- we thought Bryce was over-crowded! Bryce would undoubtedly have more visitors if it was closer to a freeway like Zion is. 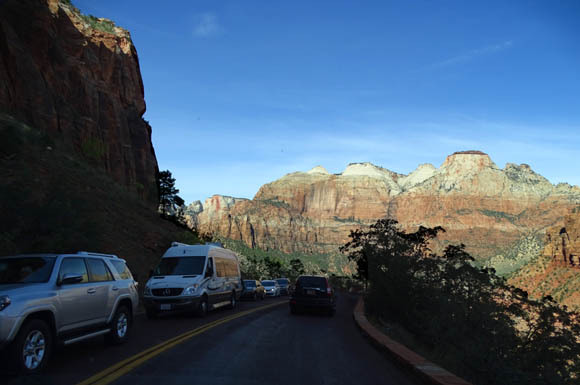 When we did a day trip to Zion from the east on October 8 we couldn't wait to get out the other side of the park. We just wanted to re-familiarize ourselves with the terrain and go into the visitor center since neither of us had been here for several decades. We had the dogs with us and knew we couldn't leave them in the car to do any hiking in the park. Colorful rock formations between the east entrance and Zion Canyon Rd. We couldn't find a parking space for our car at any of the good overlooks on Hwy. 9 through the east side of the park (you have to ride shuttle buses through the more popular Zion Canyon section of the park), nor were there any spaces in the large parking area at the visitor center. We continued driving through the touristy town of Springdale on Hwy. 9, eye-balled a couple promising -- and full -- private RV parks, and circled north to I-15. We did drive through the Kolob Canyon section of the park with a separate entrance station visible from the freeway. I took photos but we did no hiking there either. Many fewer people visit that unit of the park because it's not as spectacular as the Zion Canyon part. 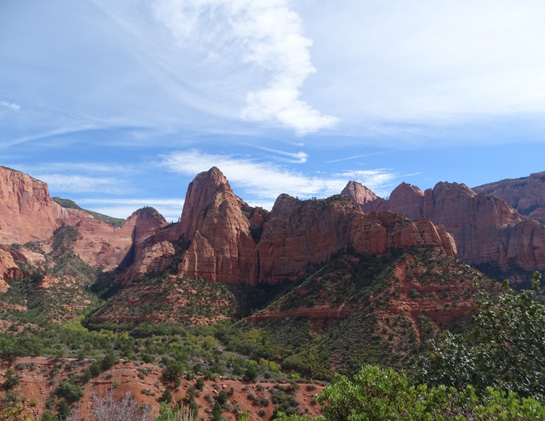 Scene from Kolob Canyon: impressive, but it can't compete with The Narrows or Angel's Landing. 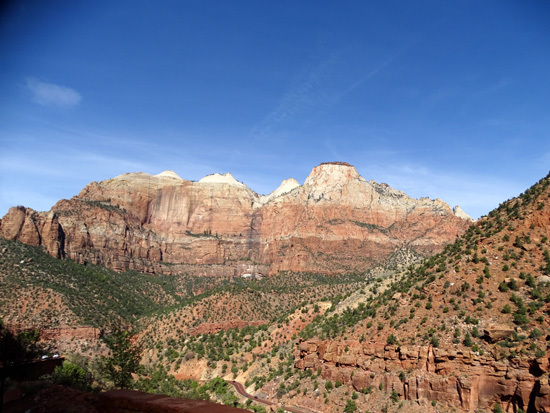 We still want to explore the main part of Zion so we made a reservation after spring break in April at a private RV park in Springdale just half a mile from the park's west entrance (near the visitor center). We'll add to those increasing numbers of visitors in 2016 and keep our fingers crossed that the park isn't as busy that early in the spring. I'll have more photos from this autumn day trip in a separate entry. We also considered camping somewhere near the North Rim on the way down to the northern metro Phoenix area for the winter. 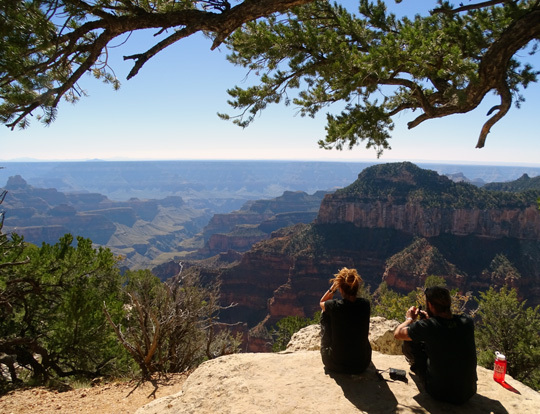 We've both been to the South Rim as recently as the early 2000s but it's been many years since Jim camped on the north side of the canyon with his kids and I've never been to the North Rim. On October 11 we did a day trip down US 89 through Kanab, UT to Jacob Lake, AZ, checking out private and National Forest Service campgrounds and potential boondocking sites along the way. 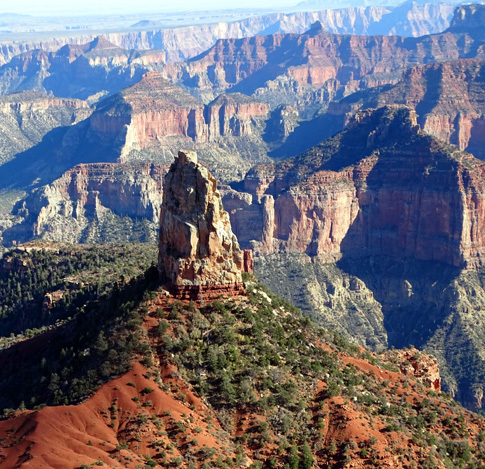 We took AZ 67 another 42 miles to the national park visitor center at the North Rim and spent a couple hours there. We didn't find a campground that we either liked enough or that would be open as late in October and early November as we'd want to stay there this fall. Like Red Canyon Village RV Park, the campgrounds at these higher elevations shut down when the pipes are likely to freeze. We did enjoy the day trip to the North Rim and learned more about the area that might be useful to us another year. OK, that's the overview of places we visited during our month at Red Canyon. Stay tuned for details and lots more scenic photos.